The Parameters Window displays metadata which applies to the whole table (rather than that for each column). You can display it using the Table Parameters ( ) button when the chosen table is selected in the Control Window's Table List. In table/database parlance, an item of per-table metadata is often known as a "parameter" of the table. At least the number of rows and columns will be listed. Some table file formats (for instance VOTable and FITS) have provision for storing other table parameters, while others (for instance CSV) do not. In the latter case there may not much much of interest displayed in this window. The top part of the display is a JTable with one row for each parameter. It indicates the parameter's name, its value, the type of item it is (integer, string etc) and other items of interest such as units, dimensionality or UCD if they are defined. If a column of the table has no entries (for instance, the Units column might be empty because none of the parameters has had units defined for it) then that column may be absent from the display - in this case the Display menu can be used to reveal it. You can interact with this JTable in the usual ways, for instance dragging columns sideways, changing their widths, and sorting the entries by clicking on the headings. You can edit some parameter values and descriptions by double-clicking on them as usual. The bottom part of the display gives an expanded view of a selected parameter (click on a row in the top part to select one). This is especially useful if the parameter value is too long to show fully in the table display. In most cases you can edit the fields here to change the value and other characteristics of a parameter. Pops up a New Parameter Window to allow you to add a new parameter to the table. 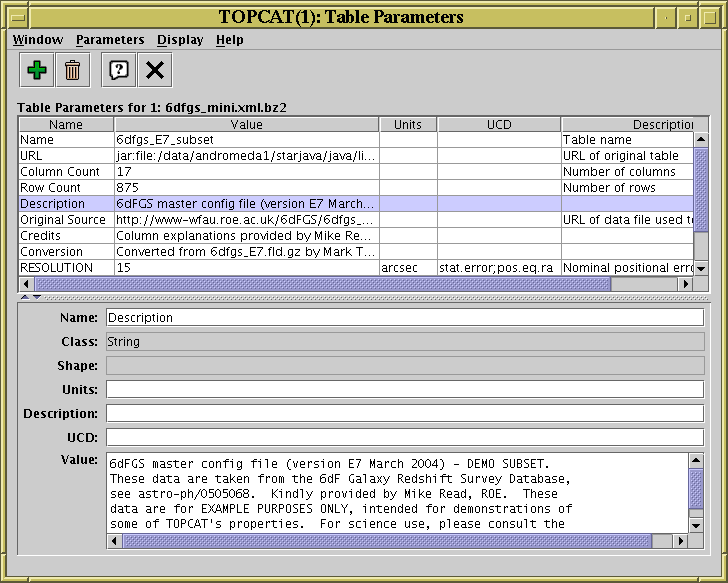 If one or more of the parameters displayed in the JTable in this window have been selected by clicking on the relevant rows, then clicking this button will remove them. Some parameters such as Row Count cannot be removed.